The Toyota Corolla has long been one of the most popular compact cars on America's streets. For the 2020 model year, this well-loved car has been totally redesigned. Toyota's innovative team of designers and engineers has made some great updates. The new Corolla promises to be as reliable as ever, but with some great new features for a new decade. The new Corolla has an athletic stance and silhouette. The front end is sleeker and more aerodynamic. The headlights and taillights have been redesigned to improve visibility on the road. 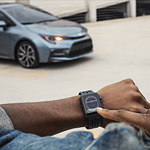 In the new Corolla, drivers can see more clearly and be confident that they're being seen more clearly. Tech-savvy drivers will be happy to know that Apple CarPlay comes standard on the new Corolla. An eight inch touchscreen display is also an available option. This helps drivers make calls, get directions and control media safely. Come see us and the new Corolla at Mann Toyota today.